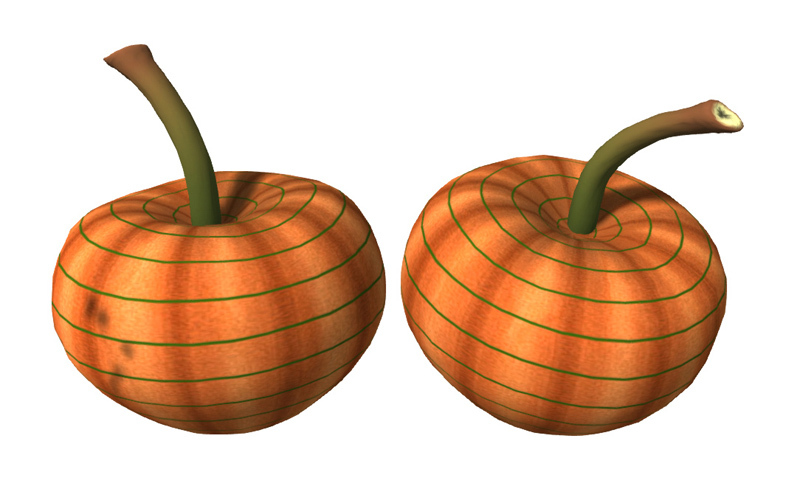 Prim Perfect’s Halloween Hunt and Quest: Hunt Hints! 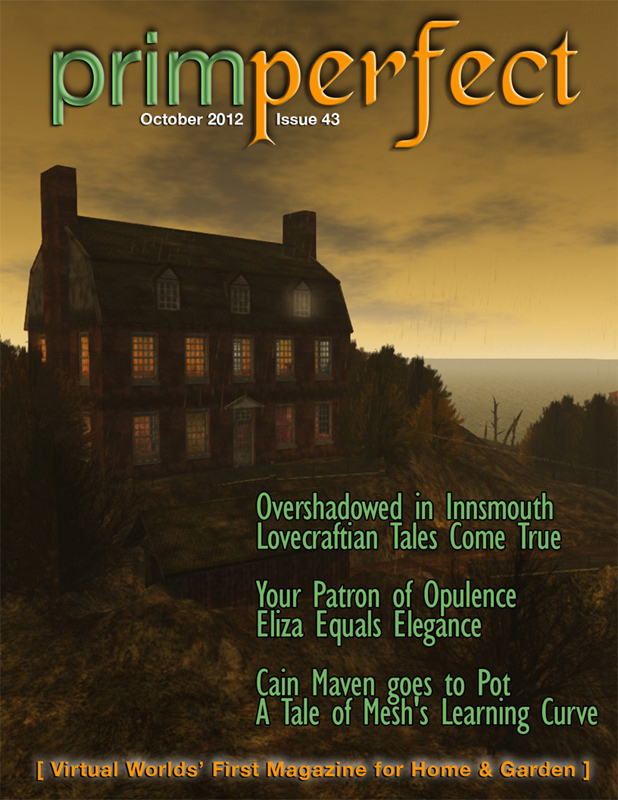 There’s a Halloween Hunt – and a Quest in this edition of Prim Perfect! Read Honour MacMillan’s article in this month’s issue of Prim Perfect (page 48) and you’ll find descriptions of 10 spooky places. Each of these regions has hidden a gift for Halloween – along with a Prim Perfect Quest token. 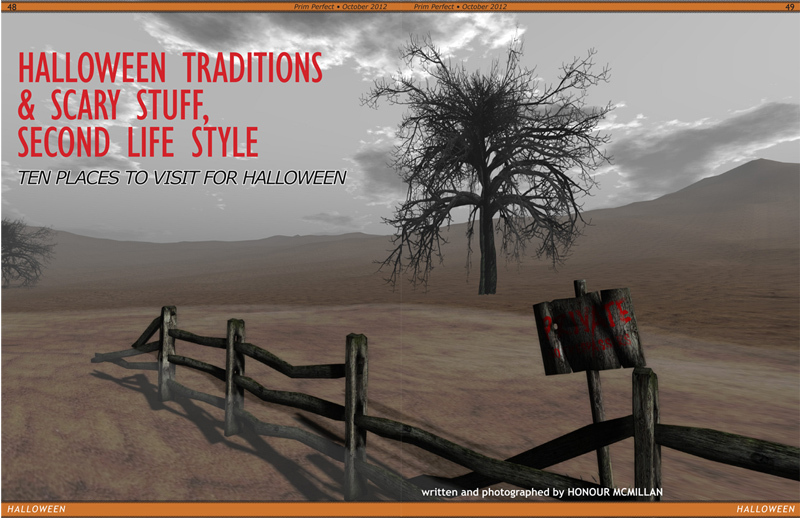 Prim Perfect No.43: October 2012 – Halloween Places to Visit – from Honour Macmillan! A ghost in polka dots, a red tree and Pumpkin Lake. Easy! You will go “batty” as beneath the ground you will have to go. Relax, have a rest, gather your courage for the Ride! Climb the stairs in the “Ivory Tower” and look right and left for what you seek. Don’t annoy the red eyed monster to the point of pulling his hair out! Arm yourself, stroll through the town, see the children in the playground and find the nearby factory. 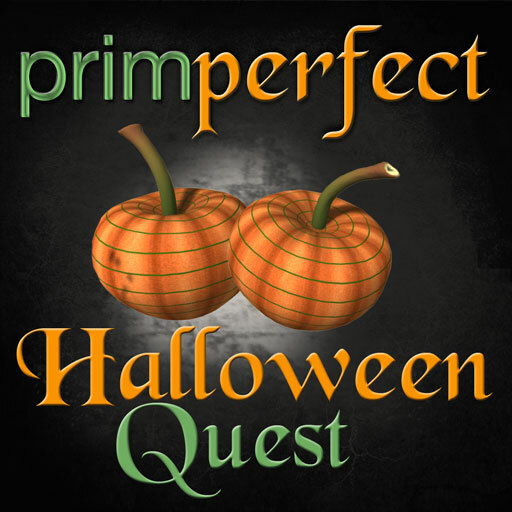 Prim Perfect Halloween Hunt and Quest – the Hunt Object! In addition to the Halloween Hunt, there’s also a Quest, with a winning prize of $5,000. At each of the Hunt locations, you’ll find a token. 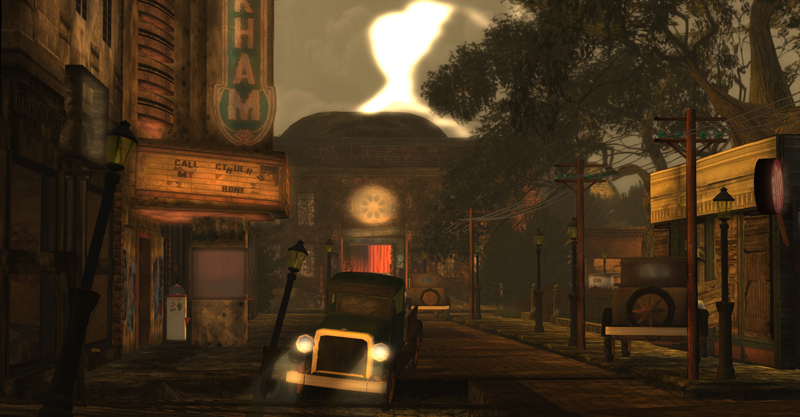 You’ll also find ten more tokens hidden at the Ten Special Places we’ve chosen on our sim of the month, the Lovecraftian-inspired Innsmouth. You can read about these ten places in Java Jetcity’s article on Page 34 of this month’s magazine. 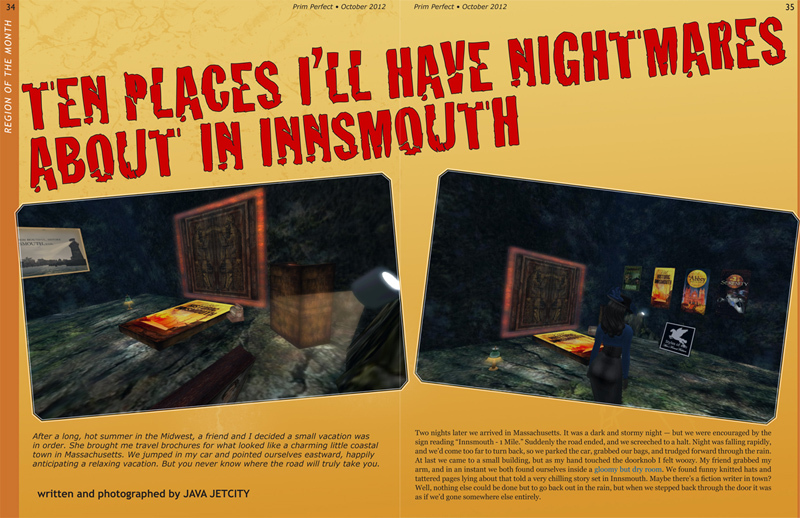 Ten Tokens scattered across the Halloween Hunt sims … ten tokens in Innsmouth … and ten tokens in our magazine too! Yes, that’s right—we are running part of our Quest in the pages of this magazine! As you read through the inworld edition of the magazine, look for the GIFT tabs on the left and right pages. You’ll see that some of these are highlighted which means that you can collect a gift. It might be a gift from an advertiser in the magazine… or it might be one of the special tokens for the Quest—you’ll have to click the GIFT tab to find out! When you have collected all 30 numbered tokens, you rez a prim and then drop all of the Halloween tokens into it. Rename that prim PPHQ – <<your avatar name>> and then send it to Whiz Wonder.